Taken outside the back door of Moonfleet. an' folk thinks am daft, But thee ken this....I gets a lot o' free drink for beein' daft!!'' What a happy man! I think my first memory of Cromarty was meeting Jimmy. 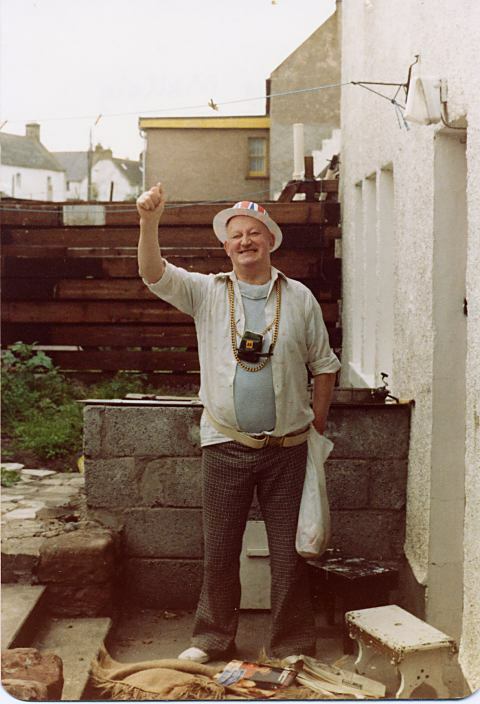 I still quote his saying to me to this day "the sun always shines in Cromarty...You just can't see it for the clouds"
There is a man in CROMARTY who is winning local fame he plays more parts than a movie star JIMMY MALLAIG IS HIS NAME. WI BEADS & BANGLES LOLLIPOPS HE IS ONE OF KOJACKS COPS! IN CROMARTY HE IS THE TOP. Futher addition to pic.758 part of a poem I wrote for JIMMY. I worked with JIMMY at the salmon fishing at EATHIE. A great character sadly missed GOD rest his soul.